The time for the Astir Palace in Vouliagmeni to shine again is almost upon us. The landmark resort on the Athens Riviera, now owned by AGC Equity Partners and operated by Four Seasons Hotels and Resorts, is set to reopen on March 29 following an extensive overhaul. Five years after the announcement of the tender for the sale of the Astir by National Bank of Greece and the Hellenic Republic Asset Development Fund (TAIPED), the renovation of the facilities has been largely completed and travelers can choose between three super-luxurious settings: the laid-back Arion, with 101 rooms and suites ideal for relaxation, the Nafsika, with 133 rooms and a lively atmosphere, and the 61 seaside bungalows, which offer sublime privacy. On the first weekend that bookings could be made via the Four Season’s website, prices ranged from 365 euros per night for a room with a kingsize bed, gorgeous marble bathroom and balcony overlooking pine trees, to 2,860 euros per night for a bungalow suite with its own private pool. These are, of course, off-season prices: In August the price of the former will rise to 870 euros, while the latter will set you back 4,250 euros. The business strategy is clear: The Astir is aimed at guests in the highest income brackets. The total investment of 650 million euros makes it the biggest tourism sector project currently being undertaken in the country, and includes the top-to-bottom renovation of the hotel’s facilities, the creation of the luxury accommodation, and major upgrades to the marina and iconic Astir Beach. In addition to its sumptuous rooms, suites and bungalows, which will operate as one entity under the management of Four Seasons (in what is the luxury hospitality company’s first venture in Greece), facilities also include conference and events venues, a spa, luxury boutiques, sports and recreational facilities, a helipad, and eight restaurants and bars that will raise the Astir’s gastronomic profile. Distinguished Greek architects assisted with the renovations, including AETER and K-studio, working together with international partners such as Meyer Davis and Martin Brudnizki Design Studio. The hotel will offer a comprehensive experience of luxury hospitality year-round, meeting high standards of aesthetics and using state-of-the-art technology. The renovation of Astir Marina will begin following the signing of a presidential decree, once the required permits from the relevant ministries and the Central Archaeological Council are obtained. And while the renovation of the exterior areas of the resort have been completed, the public park at the tip of the peninsula which the new owners have committed to creating is yet to be completed. AGC Equity Partners completed the purchase of 88.46 percent of the shares of Astir Palace Vouliagmeni AXE on October 27, 2016 from National Bank of Greece and TAIPED for 444 million euros. The total investment, taking into account the development plan, is expected to surpass 650 million euros, of which 200 million was raised through a bond loan from Greek banks. A large portion of the invested capital is expected to be recouped soon through the development of the land where the now-demolished Aphrodite hotel once stood, and where 13 luxury villas will be constructed. Indeed, four of these have already been sold to a Greek businessman active in the shipping industry, while negotiations are also under way for the sale of another group of homes to a foreign investment group. Recently, Culture Minister Myrsini Zorba approved the architectural study for another 12 luxury residences within the grounds of Astir Vouliagmeni. The architectural study, which has also received the approval of the Central Archaeological Council, provides for the construction of new, independent residences with basements, swimming pools and landscaped gardens. A memorandum of understanding and cooperation was signed last May between the Ministry of Culture and the company regarding the development of the complex. The new residences will be integrated into the environment of the peninsula, with large derelict structures, including the Aphrodite hotel, the 9 Muses nightclub and others, being removed and new trees planted. It is estimated that the total number of trees will exceed 6,300, while the Astir project has also incorporated innovative methods for energy conservation and water management. In parallel, the infrastructure is being optimized while modern waste management and environmental impact monitoring are being adopted across the whole complex. 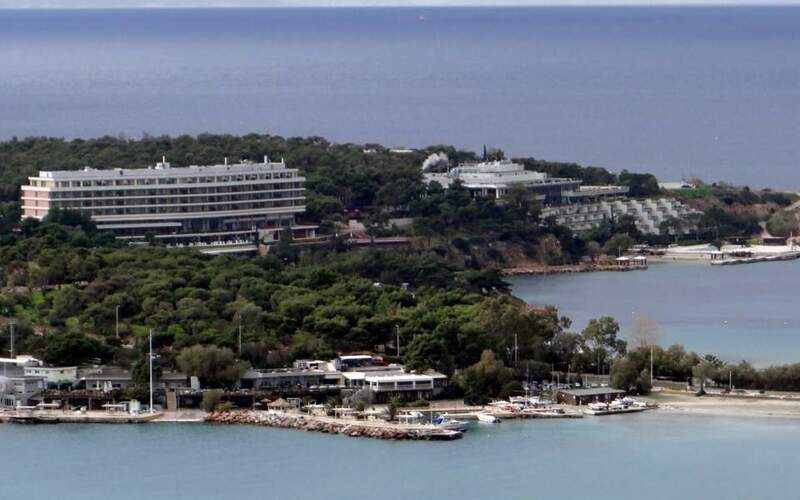 Astir Vouliagmeni’s last famous guest before it shut its doors was US President Barack Obama, while a few months previously the resort had hosted Russian President Vladimir Putin. But the list of world-renowned figures who have graced its suites, cabanas, lobbies, beaches and gardens and hallways is long: Margaret Thatcher, Jimmy Carter, John F. Kennedy, Francois Mitterrand, Boris Yeltsin, Mikhail Gorbachev, Valery Giscard d’Estaing, Helmut Kohl, Frank Sinatra, Jacqueline Bisset, Brigitte Bardot, Telly Savalas, Paul Newman, John Wayne, The Beatles, Charles Aznavour, Isabella Rossellini and Pierce Brosnan are just some of them. It is said that King Ibn Saud of Saudi Arabia would book an entire floor at Nafsika for himself and his entourage and give out gold watches as tips. Aristotle Onassis, John Latsis and Constantinos Karamanlis, not to mention almost the entirety of the Greek elite – including the stars of the Greek film industry – were once among its regular clientele. The seeds of the resort were sown in the late 19th century, when Vouliagmeni Lake became more widely known for its therapeutic waters. The Monastery of Asomaton Petraki, which owned the Laimos Peninsula, started building guest lodgings in the area. By the interwar period, the number of these units had reached 30 and auxiliary buildings were gradually added, including restaurants and cafes. The creation of a hotel was first proposed before WWII, but when that broke out all plans were shelved. Thus the land remained unused for about 15 years until 1954, when the Astir company was set up. It took another four years for a parliamentary committee to approve the development plan, while architects Emmanouil Vourekas, Perikles Sakellarios, Prokopis Vasileiadis and Konstantinos Dekavallas were commissioned to bring the plan to fruition. In 1961 the first 76 cabanas started hosting guests on the pine-shaded Laimos peninsula in Vouliagmeni. The waterskiing school – a novelty at the time for Athens – was run by Grigoris Kassidokostas (who would later marry Marianna Latsis). At the same time Astir Beach became established as a popular meeting point. In 1967 the Arion hotel opened, followed by the Nafsika in 1979, and the Aphrodite in 1984. The 2016 sale of the Astir Palace marked the end of a stellar chapter in Greece’s tourism development, one that helped the country become a world-class destination, and now, under the expert management of Four Seasons, the next one is set to start.